It’s New Year’s Eve. It’s the day where we all start looking forward to the New Year and all of the positive changes that we hope it’ll bring. And, to be perfectly honest, 2018 was the devil for many of us. For many of us, this was the year that really beat us down until we were giant, ooey gooey messes on the floor crying out for some semblance of relief. And it was hard to find that positive light to keep us going to the end of the year. However, as was so brilliantly demonstrated to us by Mary Poppins Returns, sometimes all we need is that one speck of light in the darkness to keep on going. That is the lesson that we should take from that film with us into 2019. 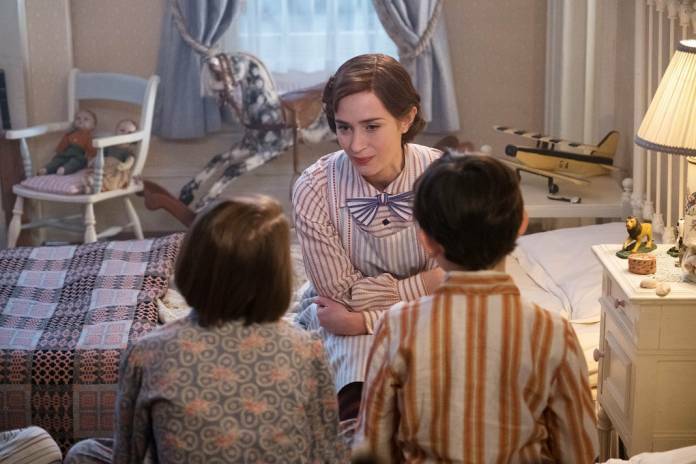 At the beginning of Disney‘s Mary Poppins Returns, we are met with the Banks family and they are currently experiencing the bottom of the barrel. Disregarding Jane Banks, the rest of the Banks family is in danger of losing their home. It’s been less than a year since Michael has lost his wife and they are struggling to get by in all aspects of life. With all of the negative things that have taken place up to where the audience first meets the Banks, it is hard for anyone to find a smidgen of light or positivity to keep their spirits up. This is when Mary Poppins arrives. There is much resistance at first when Mary Poppins swoops in and starts working her magic on all of the Banks children. While it is easier for Michael’s children to grasp the lessons that Poppins has been relaying to them, it is more difficult to break past the stubbornness displayed by Michael. It is only when everyone begins to start focusing on the little things, the things that light up that childlike wonder inside a person and forces them once again to carry that hope deep inside their hearts that things start to turn around for the Banks. With a combination of a changed mindset and approach to life and problem solving, all of the Banks are able to save their home and restore their spirits in Mary Poppins Returns. We have all had a glorious array of ups and downs during 2018. For many of us, we are ready to leave the chaos that 2018 brought with it behind. However, we cannot leave the negativity behind unless we are willing to make a decision. This decision we need to actively focus on making is finding the light within the darkness. It is so easy to let yourself drown in negativity when it seems like everything is going wrong. However, when everything seems rough, try to find that one teensy weensy speck that you can hold onto. I think if we take anything from Mary Poppins Returns into the New Year, it is that mindset.